Location Cook County, Minnesota, USA. Nearest city Duluth, MN. Governing body National Park Service. Grand Portage National Monument, a United States National Monument located on the north shore of Lake Superior in northeastern Minnesota, preserves a vital center of fur trade activity and Anishinaabeg Ojibwe heritage. The Great Hall at Grand PortageThe Grand Portage itself is an 8.5 mile footpath which bypasses a set of waterfalls and rapids on the last 20 miles of the Pigeon River before it flows into Lake Superior. This path is part of the historic trade route of the voyageurs between their wintering grounds and their depots to the east. This route, composed of the Pigeon River and other strategic interior waterways as well as the Grand Portage and many other important land portages, was of enormous importance in pre-industrial times, as it provided quick water access from Canada’s settled areas and Atlantic ports to the fur rich NorthWest. Some 50 miles upstream from Lake Superior, this trade route crosses the Height of Land Portage connecting South Lake on the Pigeon River watershed with North Lake of the Rainy River watershed. This portage crosses the Northern Continental divide and therefore provides passage between the drainage basin of the Arctic Ocean and that of the Great Lakes and Saint Lawrence River to the Atlantic Ocean. Ojibwe Wigwam at Grand Portage painted by Eastman Johnson in 1857As early as 2,000 years ago, Indian Nations probably used Gichi-onigaming, or the Great Carrying PlaceÂ, to travel from summer homes on Lake Superior to winter hunting grounds in the interior of Minnesota and Ontario. In 1729 Cree guide Auchagah drew a map for some of the first French fur traders showing them how to reach the “western sea” of Lake Winnipeg. In time, Grand Portage became the gateway into rich northern fur bearing country connecting remote interior outposts to lucrative international markets. 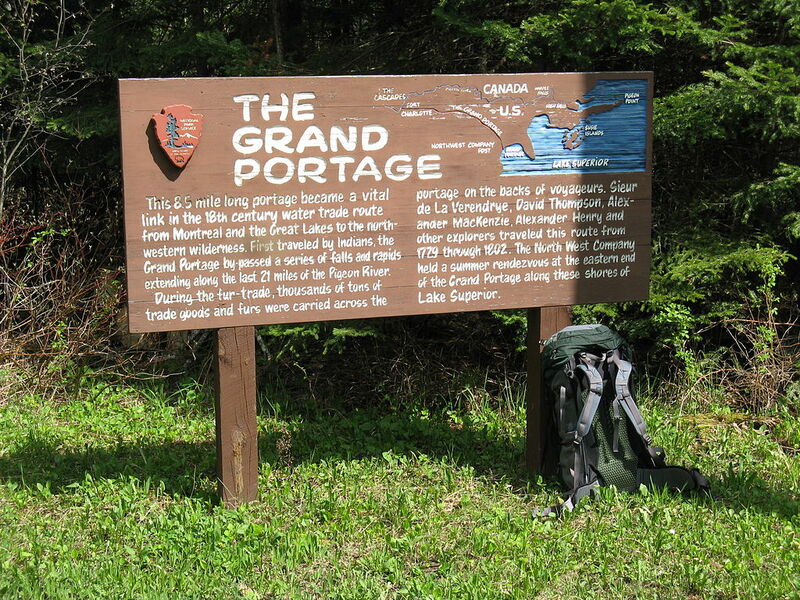 The Grand Portage trail itself is an 8 1/2 mile trail connecting Grand Portage with Fort Charlotte on the Pigeon River. Voyageurs from the interior of Canada would carry their furs by canoe to Fort Charlotte, and portage the bundles of fur to Grand Portage. There they would meet their counterparts from Montreal, and exchange the furs for trade goods and supplies. Each canoe “brigade” would then return to its starting place. Canoe Manned by Voyageurs Passing a Waterfall (Ontario) painted by Frances Anne Hopkins in 1869In mid-July 1802, partners of the most successful fur trade company in North America, the North West Company, met in their Great Hall at Grand Portage, Minnesota and voted to move their summer headquarters from the protected shores of Lake Superior’s Grand Portage Bay 50 miles north to the mouth of the Kaministiquia River. Almost from the time the Anglo-Scot Nor’Westers had organized at Grand Portage in the mid 1780s an emerging United States wanted them out. The July vote would mean that 18 buildings constructed from native squared spruce, pine and birch and over 2,000 cedar pickets surrounding them would be torn down, transported north in company schooners and used in constructing the new Fort William far from U.S. soil. Reopened in 1951 as Grand Portage National Historic Site, it was designated a National Monument in 1958, and the portage trail itself is a Minnesota State Historic Site. The monument’s 710 acres lie entirely within the boundaries of Grand Portage Ojibwe Indian Reservation. The reconstructed depot celebrates fur trade and Ojibwe lifeways. It was added to the National Register of Historic Places in 1966. The portage trail exists in much the same location and condition today, and visitors can hike 8.5 miles from Lake Superior to the Pigeon River. Volunteers and park staff dress in period attire and explain and interpret what life was like at the turn of the 19th century. Every August, Grand Portage National Monument hosts a rendezvous re-enactment and the Grand Portage Ojibwe Indian Reservation holds a pow wow.